SuperHero ABC (Library Binding) | Let's Play Books! Learn the alphabet from A-Z with mighty superheroes! Silly and zany, and armed with the most unusual skills, the cast of superheroes that fill these pages will make learning ABCs an out-of-this-world experience. Meet Bubble-Man, who blows big bubbles at bullies; Laughing Lass, who laughs loudly at lawbreakers; and many more hilarious and irresistible characters from renowned comic-book illustrator Bob McLeod. Drawn in comic-book style, this picture book is perfect for fans of DC Super Heroes ABC 123 by David Bar Katz. Bob Mcleod is a comic-book illustrator who has worked on such projects as Spider-Man, Superman, and The Phantom. 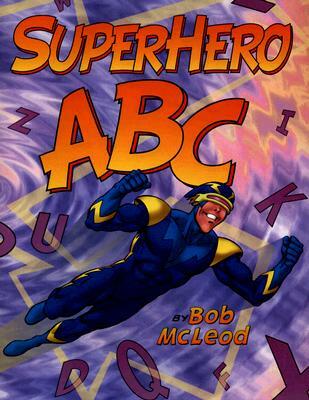 SuperHero ABC is his first children’s book. he lives with his wife, Lucy; their three children, Molly, Jeff, and Andy; and their dog, Penny, in Pennsylvania.